During the meeting in Muharraq, the PM reiterated the government’s stance in implementing the very much-publicized National Assembly ‘anti-terror’ recommendations made on the 28th of July. The Bahrain opposition has accused the government of implementing tough security measures aimed at peaceful protesters and activist by dressing them up as terrorism laws. Some of these measures include the banning of protests and the revocation of citizenship. The definition of terrorism has been left vague in the law. The Prime Minister has also threatened that “all measures” will be taken against terrorism and “those who incite it” calling them “evil terrorists and instigators who disseminate fallacies and lies”. Last month, the Prime Minister made some equally controversial comments. On July 1st, he visited police officer Mubarak bin Huwail - the day that the officer was acquitted on charges related to the torture of six medics in 2011. The Prime Minister thanked Huwail and told the assembled people that the law did not apply to them. Translation: These laws cannot be applied to you. No one can touch this bond. Whoever applies these laws against you is applying them against us. We are one body. Translation: I am here to thank you, Mubarak, for your patience and good work. A human as they say is judged by his work, and your work as a family is the reason for your reputation which is exemplary. A human is left with nothing but his reputation in life and death, and yours is a great one as a family. We are one family. 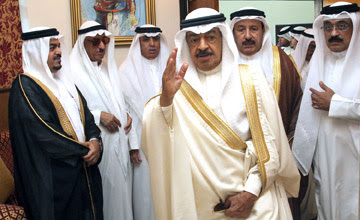 The Prime Minister’s visit to bin Huwail only reaffirm that impunity comes from the highest levels of the ruling family. It also reaffirms the fact that the judiciary system in Bahrain is neither independent nor fair; and far from being in line with international standards. Kangaroo courts and unfair trials continue against political dissidents in continuation of allegations of torture both inside and outside official government buildings; whereas those accused of extrajudicial killings or torture are either acquitted or given very light sentences in regards to the charges.